There were a number of farmers in Schaumburg Township in the 1930s, 40s and 50s who used their rich farm land as truck farms. These farms would produce vegetables for corporations such as Campbell’s Soup or to take to local markets in Chicago such as the one on Randolph Street. The Rohlwing family, in particular, raised tomatoes for Campbell’s Soup and the Piske family at the northeast corner of Roselle and Nerge Roads raised a variety of vegetables, with their main crop being horseradish. 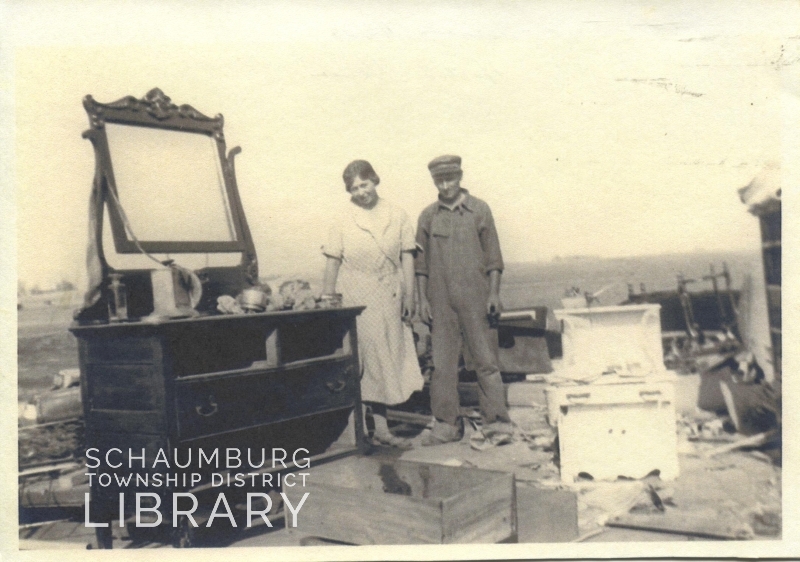 The following account of another truck farm in Schaumburg Township was written by Elinor (Hortik) Mueller for the Spring 2011 issue of the Roselle History Museum Newsletter. It is an account of the farm her father, Joe Hortik, owned and is reprinted here with the Museum’s gracious permission. 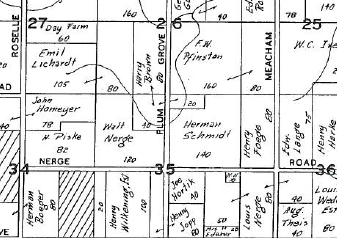 “Our farm of 40 acres, located on the southwest corner of Plum Grove and Nerge Roads in Schaumburg Township, since incorporated into [the] Village of Roselle, was strictly for raising vegetables. It was one of two truck farms in the immediate area. The other farms being dairy farms, growing mostly grain for their cattle. A variety of vegetables were grown, such as cabbage, tomatoes, onions, squash, carrots, parsnips, sugar beets, asparagus, melons, pumpkins, corn, cucumbers, rhubarb and raspberries. There was also an apple and cherry orchard, and a huge bed of gladiola flowers. Most of this produce was taken to the Randolph Street Market in Chicago where it was purchased by wholesalers and some retailers. Some vegetables were sold on the farm and to some local grocery stores. Truck farming is hard work and long hours, driving to the market at 2 a.m. and then working until the next day’s load was ready for delivery. From planting in spring until harvesting in fall there was always plowing, planting, cultivating and harvesting to do. In the winter there were always machines to repair. This entry was posted on December 9, 2018 at 7:00 am and is filed under Farms. You can follow any responses to this entry through the RSS 2.0 feed. You can leave a response, or trackback from your own site. How about that! I wax tales-long into the night-with my friends here in New Hampshire about the days I worked with farmer Joe Hortik tying up cauliflower heads-no self blanching heads back then- on his farm back in the 1960’s. Farmer Joe was up in age at the time…he would drive me out to the field in the back of his old Ford Pick-up truck with the Woody Woodpecker sticker on the back window. I just loved pumping that ice cold water from the well pump by the barn, out back of the house! Incredible history, and so lucky to have Bruce Trivellini as a good friend in NH. LOVE when he tells us stories about his time on the farm of Joe Hortik.